You are here: Home Idea Probe Idea Probe - Doll houses - Is this market right for you? As a wood craft, building doll houses has its challenges from having to work with miniatures to detailing them sufficiently to be somewhat realistic. This amount of detailing can get quite laborious and would have to be reflected in your price strategy. Another hurdle to consider is if you decide to sell these online. Because of their size, shipping becomes an issue often requiring that the doll houses be shipped as kits for assembly by the buyer. This, in itself, means that the construction design must accommodate disassembly and simple reassembly while maintaining the integrity of the piece. 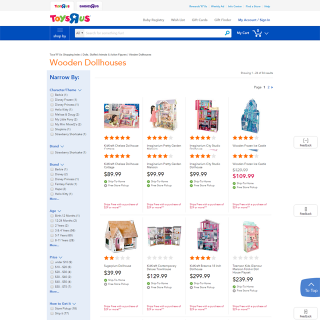 Regardless of these hurdles, the popularity of doll houses and the potential for 'micro-niches' makes wooden doll houses worthy of further analysis. The seed keyword used for this analysis was: wooden dollhouse. custom - this can be quite interesting by offering a service where the doll house design is based on photographs of a real house. Depending on the level of detail reproduced, the price for such products could be at the top end of the range. Not much competition here. boys - traditionally, doll houses were targeted specifically to young girls. Although existing products can be enjoyed by both sexes, a line of doll houses focussed more on modern unisex activities including game rooms, garages, workshops, gyms, etc would likely be a welcomed update to this old product line. Of course, all the furniture and accessories that would go with those specific room types would also be an opportunity. So, take your time and review the word analysis above and determine if you can include or focus on some of the ideas presented. The Dollhouse market seems to offer a wide range of opportunities. By using our Google analysis and the popular searches on Etsy and Amazon, you now have a much better idea of the possibilities to design, build and sell items that are sure to please many customers. What you decide to do is entirely in your control.